You’re a new recruit and you were told that this was going to be a standard mission. Of course, they didn’t tell you this sort of mission would entail you watching as a number of villagers were shot before your very eyes. It didn’t sit well with you and when you finally said something to your commanding officer, she orders you to kill your best friend, who instead sacrifices herself to save your life. After running into the frozen wastes you soon pass out from exhaustion. 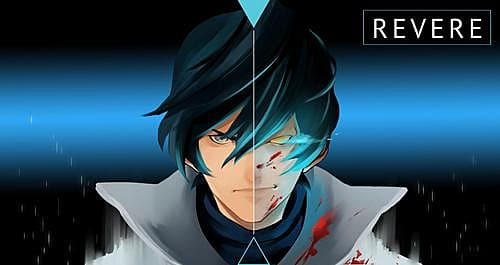 This is A Story of the End - Revere a JRPG styled game that follows Troy on his path for redemption after witnessing the atrocities the Lumerian army was capable of. You’re treated with suspicion and ire, but while the path may be slow, it will certainly be interesting. I had a chance to sit down with the lead developer Darrel Wijaya and discuss this path, as well as his Kickstarter which as of this article is still going on. GameSkinny (Angelina Bonilla): How do you plan to have Revere stand out among the library of many solid JRPG titles both indie and AAA? What makes your game different or special in particular? Darrel Wijaya: This is a tough question, however the odds of JRPG titles standing out today are very slim compared to other genres. Hopefully with the copy I’m releasing it would garner enough attention to create that “butterfly effect”. I could say that it has good visual retro aesthetics, and the battle system has some meaning to it in terms of being related to the plot -- However, perhaps all I can do is hope that JRPG enthusiasts like myself would find time to enjoy this game at their own leisure. GS: In the demo, Troy’s dialogue is straightforward and you don’t get much choice in what he says. Will we get to have some control over what Troy says and how he asks certain questions in the full game? Wijaya: Yes, because the demo is pretty much setting the tone for the game itself. In the actual game, you don’t just get too choose dialogue, but, you get to poke around things and hopefully change the outcome of the story. We’ve made it a point that when completing certain aspects of the game it will unlock different lines or speeches. Hopefully this will allow players to poke around a little. GS: Will only the important characters have full sized pictures of themselves when they talk, or will we get to see them for some of our quest givers too to add some extra impact to the game? 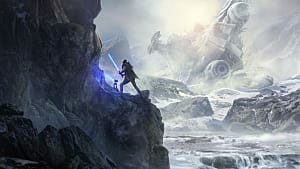 Wijaya: Finding someone who can draw like that has been difficult, unfortunately because my team is solely comprised of freelancers, it’s often times that artist disappears for a lengthy period of time. We end up hiring more artists and thus cluttering the game with inconsistencies. So at some point I decided enough was enough. WE THOUGHT, of making silhouettes but that would just ruin the aesthetics. 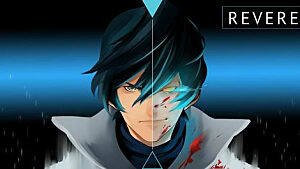 GS: Revere has elements of both real time and turn based battles at once. How do you plan to best entwine the two? Would it be possible for a player who prefers one style over the other to play entirely in that? Wijaya: Well yes, the real time battle system is merely part of the story. We plan to let the player feel how he could handle the situation. Of course given that at certain times the player must stick to a style due to the plot advancing. 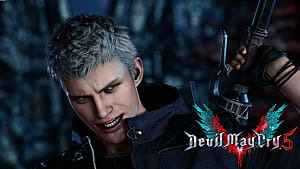 GS: Will there be any optional or unlockable bosses that may not be apart of the storyline but allow for extra EXP and loot? Wijaya: There are TONS of optional bosses. We’ve got em’ lined up for you. GS: Are the party members displayed on the Kickstarter page the only party members or will we have more to meet later on? Wijaya: As of now they are the only party members. GS: Will each boss have their own unique battle themes or will there be universal battle theme for the mini bosses and unique ones for the later bosses? Wijaya: There are several battle themes depending on the contexts. Of course there are specific themes for important bosses that relate to the story. GS: Your main character Troy is out for a quest of redemption from the atrocities committed by his people, as well as his involvement with the attack on the village. 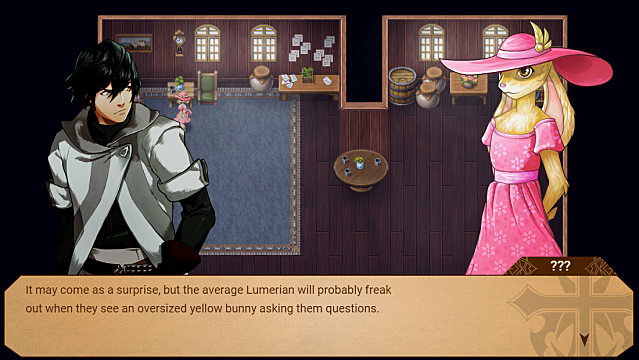 The Lumerians as a whole are framed in a negative light by people outside of Lumeria but do we get to see anyone who actually likes what they are doing? Will a sort of moral grey area be present that further complicates the narrative? Wijaya: Yes, in the game later on there is an underground society who’s trying to keep away a deranged cult that believes in genocide and racial segregation. GS: With your focus on visual novel-esque narrative elements, how important would you say the narrative is compared to the battle and gameplay elements? What would be your ideal way of balancing the two nicely? Wijaya: To be honest, we wanted to make both stand out as best as we can. We approached this visual novel-esque appeal because we took inspiration from games such as Fire Emblem which did balance out battle and visual novel elements pretty well. By displaying character images and their sprite counterparts we’d hope this would embellish the game further -- making it more appealing to the audience. I would like to thank Darrel Wijaya for taking the time to answer my questions. Story of the End - Revere looks like a dramatic JRPG with a story about redemption, prejudice and loss. Check out Story of the End - Revere’s Twitter for updates. If you want to show your support, there's still time to back Story of the End - Revere on Kickstarter!